“Alarmingly low” was the term used by authors of a new study published in Diabetes Care that reported on the frequency of eye exams by people with diabetes. The researchers studied insurance companies and employers that supplied data from 2010 to 2014 to IBM Watson Health. The researchers identified nearly 300,000 patients who had Type 2 diabetes and did not have diabetic retinopathy. They determined that 48.1 percent of these patients did not have an eye exam during the study period. Perhaps even more disturbing, only 15.3 percent had met the recommendations of the American Diabetes Association (ADA) for an eye exam every one or two years. 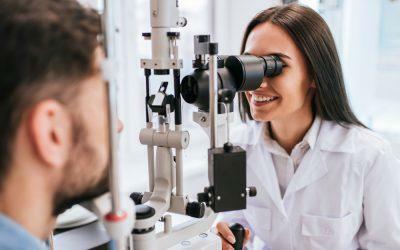 When it came to the nearly 3,000 patients with Type 1 diabetes and no diabetic retinopathy, 33.6 percent had no eye exams during the study period and only 26.3 percent met the ADA guidelines. And what about those diabetes patients who did have eye exams? The researchers discovered that 24.4 percent of the Type 2 diabetes patients actually did have diabetic retinopathy, with 8.3 percent having vision-threatening retinopathy. Among the Type 1 diabetes patients, 54.0 percent had retinopathy and 24.3 percent had vision-threatening retinopathy. In other words, it’s apparent that there’s a lot of undetected diabetic retinopathy among people with diabetes. It’s no wonder that the researchers were alarmed.